But [Hawkins] calls those Southern excursions "a tremendous experience" and no doubt believes CU will be better for its first trip to an SEC site in 26 years. "They do it up right," Hawkins said. "It's like here, kind of, but on a bigger, grander scope. Everybody dresses up; it's an event. The visiting team goes in there and they love you up. They have you come in, eat their barbecue, are glad to have you. "Then, when the game starts, they're like, 'You can yell for your team all you want to, but don't say anything about our team - or it ain't gonna be good.' It's one of those things that make college football great. It's a great atmosphere and great tradition. And, oh, by the way, (Georgia) happens to be one of the better football teams in America." Also from the Rocky Mountain News comes "Colorado to Face Lights out UGA Defense." • No. 114: CU's weekly ranking in scoring offense (7.67 points a game) among 119 NCAA Division I-A teams. • No. 2: Georgia's weekly ranking in scoring defense (3.3 points a game). • No. 115: CU's position in total offense (193.67 yards a game). • No. 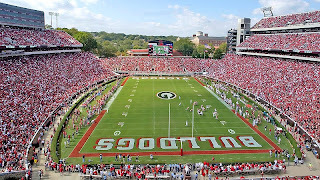 5: Georgia's position in total defense (203.67 yards a game). Having said and read all of that. This team isn't as untalented as their record would indicate. More on that later. Your comment in the last line was right on - CU possesses the most talent of any team we'll see prior to UT game. Now, they've played horribly and really look lost trying to assimiliate into CDH new program/strategy, but they come into this game with NOTHING TO LOSE other than to kick start their season with a close game against a superior opponent. Add to this the fact that it is a 12:30P kickoff with a late-arriving Samford Stadium crowd and multiple injuries in the OL & WR and it spells a day of un-met fan expectations. I don't see us losing at all - I just see it as one of those games that we can never put away until the last one or two drives. CU hasn't scored more than 1 TD in any of the games during their current 7 game losing streak so scoring 21 in this game is a real longshot. They've scored 10,10 and 3 points respectively in their first 3 games this year and none of those games were on an opponents home field. Their only chance to keep it close is to win the turnover battle by 2 or 3. That's not out of the question since we have a true FR QB and need to start opening the offense up...we can't just wait until the Tennessee game to do it and hope it works then. I agree with the comment and pwd's last line. CU shouldn't be this bad, and we shouldn't take them too lightly. It was Hawkins who made perhaps the greatest halftime comment ever last year against the Bulldogs. When asked by the witless newsperson whether he was going to pull his quarterback, the Hawk looked a little astounded and just asked, "did you see the first half?" Very zen. I knew then and there that Boise State had no idea what was coming to them. I'm surprised they made it down ot the field by kickoff. Have to disagree with your last statement. This Colorado team is terrible. Poorly coached, no athletes. There are 12 SEC teams who would run it up on CU. I'm thinking like 47-0.